Today We shall speak about dealing with resistance and hostility to the New Message. This is for all who would assume the mantle of responsibility of representing and speaking for the New Message in the world. God’s New Revelation will generate considerable resistance and hostility. The very notion that a New Revelation can be given and that God has spoken again will arouse some intense rejection and admonition from others. This represents the blindness and stubbornness of humanity, who presumes to understand God’s Intentions and God’s Presence in the world. It is unfortunately the problem of communicating something pure into an impure world, something beautiful to minds that are not beautiful, something essential to minds that cannot hear and receive. The Messenger is not to debate with others, for Messengers are never asked to do this. To contend with the defenders of other faiths is a fruitless effort. They will only seek to demean you and to destroy what you are presenting. When people say: “Well, Jesus said, ‘No one comes to the Father except through me,’” he is referring to the power of Knowledge within himself, the same power that resides within you and others, waiting to be discovered, waiting to be followed. Submit to this, and you will understand your Jesus. All the disclaimers to the New Message are misunderstandings. All rejection is fear. Even arguments about ethics or theology in most cases means that the individual has not really looked into the New Message or experienced it or applied it in their life. It is this unwarranted rejection, this fearful response, this taking issue that demonstrates that the person really does not understand what they are looking at and therefore should be invited to experience the New Message more deeply before coming to conclusions and certainly before rejecting it outright. This represents honesty and an honest approach. To reject the New Message out of hand is to be dishonest. It is to make a judgment on something you have not experienced and do not understand, and that is not really honest. When people ask: “Well, what is this really going to do for the world? 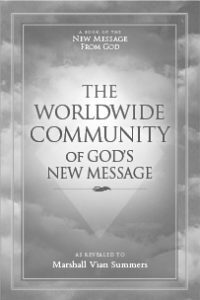 How is this going to solve the world’s problems?” you may say that God’s New Revelation teaches people what to listen to within themselves and what must inform their opinions and decisions. This is what determines the outcome of all events. People say, “Well, what is new about the New Revelation? It talks about things that we’ve all known about or are unimportant.” The Revelation speaks of the mystery of your engagement with the Divine and how you can experience God’s Will in your life. There are very few people in the world who know anything about this. And though it is presented at the heart of all the world’s religions, this great truth has been tremendously obscured by human belief, interpretation and assumption. When you encounter indifference regarding the New Message, it is fine. Look for those who can respond now. Look for those who are ready. Look for those who have an honest approach and are not merely trying to use this as they are trying to use everything else as a resource for themselves, to embellish their beliefs and presumptions and position in the world. They will seem to be a very few, but across the world they account for a great number of people. These are the first to respond to the New Revelation. They will come from all walks of life, from all economic positions, from all races and religions. They will represent the educated and the uneducated, the Western and the Eastern, the Northern and the Southern. Broadcast broadly so that you may find those who are amongst the first to respond. Do not give up. You are only just beginning. The pathway is long, but it is sure. Use wisdom and discernment and discretion. Knowledge within you will indicate especially those who are ready to hear. Be careful of those who come claiming to be interested but really are here to try to steal the information for themselves—the clever, the cunning, the manipulative, the opportunists. Be more discreet around them. Simply point to the New Revelation. But do not expend your energy with them, for they are not worthy to receive it. Those who are simple and honest, sincere and humble, will be in the best position to receive the New Revelation. Therefore, do not try to take it to the experts and the leaders of government or religion or commerce, for you will be shocked to find that the majority of them cannot hear and cannot respond. They do not have the humility or the openness. They have a huge investment in the position they have created for themselves and may be either unfree or unwilling to receive that which would alter the course of their life. Remember that the New Revelation is a life-changing experience. It is preparing people for a new life in a new world, a world that is no longer isolated in the universe. See if people are really willing to have this kind of change occur. If they are too invested in their past, if they are too attached to their current circumstances, if they are too entrenched in their life, too subsumed in their circumstances, you cannot reach them with something like this. They can only entertain it from a distance or pick out of it certain ideas that they like and disregard the rest. They will say, “Oh, I like what you teach about love, but this Greater Community part I can’t relate to this.” You see, they cannot come close to the Revelation, either practically [or] physically they are too entrenched, psychologically they are too entrenched, ideologically they are too entrenched. That is why you must seek for those who are open, honest and humble in their approach. Do not think that if you bring this to the expert, the expert will bring it to large numbers of people, for this is to play the Judas role, you see. Let that be a lesson, a lesson for all time. Do not bring the Messenger before the tribunal of the religious experts, for they will seek to destroy him. Remember, those who are simple, sincere, humble and open will be amongst the first to receive. They can recognize the New Message without becoming its severe critic. They can deal with it at a more profound and mysterious level rather than debating its ideas or assertions. You are pointing the way to the Revelation for all who can receive this and share it with others. You are here to point to the Message and the Messenger. You do not have to teach the Teaching. Just bring people to the Teaching. If you live in a foreign country, translate the New Message if you can or find someone who is able to do this, and you will play a significant part in bringing the New Message to your nation and your people. Do not worry about adversity, but be careful and discerning. If you live in a nation that has no religious freedom, you must exercise great discretion and care as to where and to whom you share the New Message from God. Do whatever you can to bring the Revelation to the people. Let them have their own experience. Let those who are ready come forth and those who are not step back. It will polarize people, for this always happens. In a way, the New Revelation from God will shine the light on everyone, revealing who is honest and who is not, who is open and who is not, who can receive and who cannot, who is humble and who is presumptuous, who has honest intentions and who does not. It reveals everyone’s position, everyone’s intentions, and in this it is a great challenge to the listener and to all peoples. It reveals that which is impure, that which is improper, that which is incorrect, that which is dishonest, that which is unwilling, that which is incapable, that which is weak, that which only pretends to be strong. Let the Revelation have its impact. Stand back and let people have their experience and see who can respond. For those who can, be available to them if possible. You do not have all the answers. You cannot teach the Teaching, for it is greater than your understanding. But you can bear witness to it and bear witness to the Messenger and to the fact that you are living in a time of Revelation.